This week our spotlight is on Allan Casco, who has been with the Foundation since its earliest days. 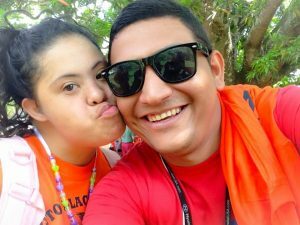 He joined the Olancho Aid family first as a student and now as a staff-member. Keep reading to learn more about Allan’s journey and what the Foundation has meant to him! When do you begin working at the Olancho Aid Foundation? How did you find out about Olancho Aid? I studied at Instituto Oscar Cardenal Rodriguez (IOCR), the Spanish-speaking college prep high school, and since then I have followed the projects of Father Richard Donahue. I’m the administrator at Escuela Nazareth, our special needs school. I love my job because it was always my dream to belong to an organization that helps people who need it. I like seeing how the students, the parents, the employees, and everyone else who takes time to spend time with us learn new things. Do you have a favorite memory from your time with Olancho Aid? I had an accident playing soccer and had to get a cast. The next day I got to school and an student ran to me and help me get out of the car. He helped me to my office and gave me a kiss on my injured leg. My heart stopped in that moment. I love to go out and walk and run while listening to music.